Home / Indoor Furniture and Misc / Cabinets all other types Woodworking Plans for Projects / A Record Storage Cabinet Vintage Woodworking Plan. 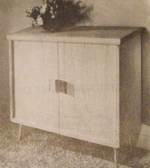 R-ANH1322 - A Record Storage Cabinet Vintage Woodworking Plan. It will be a satisfaction to own this spacious storage cabinet for phonograph records, and building it will be a simple job with this craft pattern to work from. The cabinet has various arrangements for shelves and dividers to accommodate all sizes of records and albums. The cabinet is of plywood, hardwood preferably, and its parts cut from a single 4x4 panel without waste. The door hardware, and brass legs are available at hardware stores. Includes Bonus Pattern 295, a Modern Hutch Cabinet.